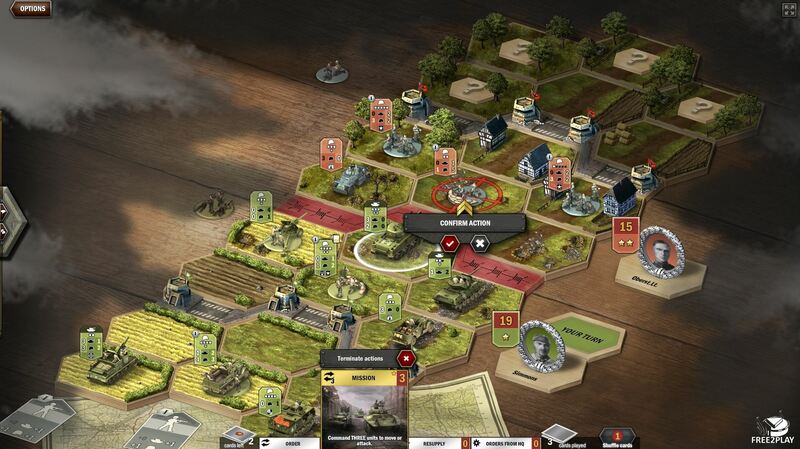 Panzer General Online is a free turn-based strategy game with CCG elements where players control their own general in battle and go up against AI and other players in one-on-one battles in a World War II setting and based on the popular Panzer General series. Players must build up their own army, collect cards and make a strong “deck”as seen in a traditional collectable card game. The game is available through web browsers and does not require a client download to play. Each general has a number of command points that they begin the game with, once the general has no more command points left then they have lost the battle. 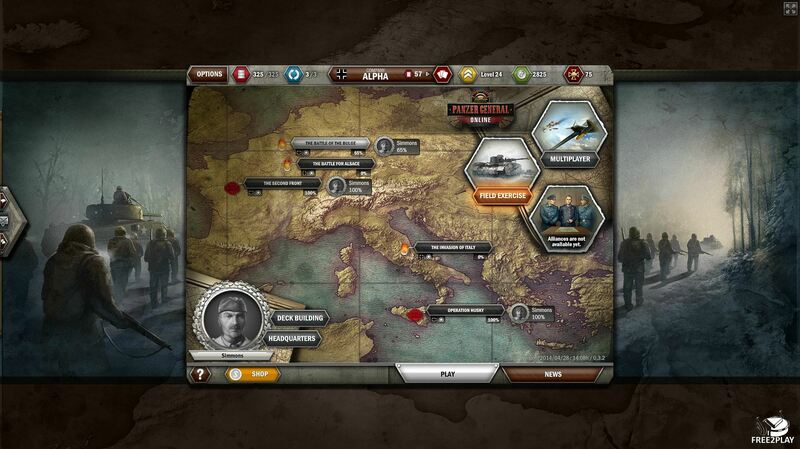 Command points are lost each time the enemy manages to perform an attack on the base as well is used up each turn when a command card is played, so players must monitor their command points carefully so as not to give the enemy and easy victory. Players can also seal victory instead of draining the commander of their command points, by successfully destroying all the enemy units which instantly grants the player victory. This is the core of the game focuses around a collectable card game, where instead of selecting cards with monsters and spells as has been seen time and time again players can collect military units and action commands that allows them to perform certain actions in battle. 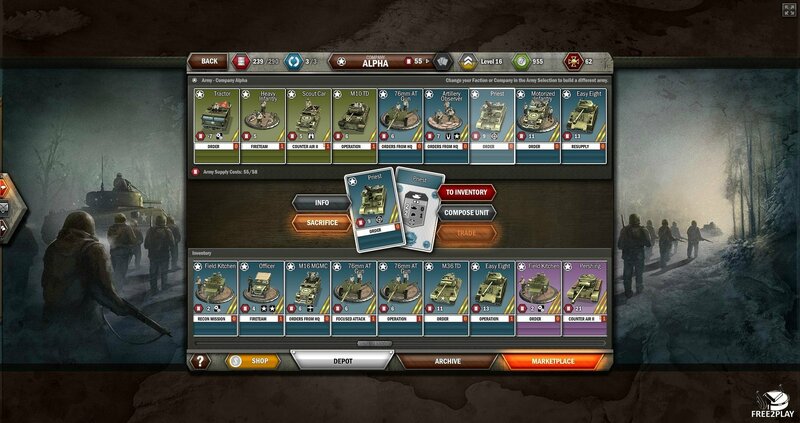 Players are able to earn, unlock and purchase a wide variety of army units made up from realistically rendered miniature is of infantry, artillery, tanks and other World War II specific units. Each unit has its own stats determining its attack power on other units, it's counter attack power as well as any Shields/armour it currently has. When combined with the powerful command cards players can create a truly personalised custom deck that offer up a huge variety of versatile strategy and tactics. The map is made up of three lanes where the units will automatically move along, but neither can move past the central barbed wire zone and so the tactics come with switching to another lane depending on which forces you are facing in a particular lane as well as covering lanes where the loss of units has left a direct line of sight to your base for attack. The look of the map is made up of individual hexagonal tiles, looking like a traditional tabletop game and the units acts like miniature figurines. 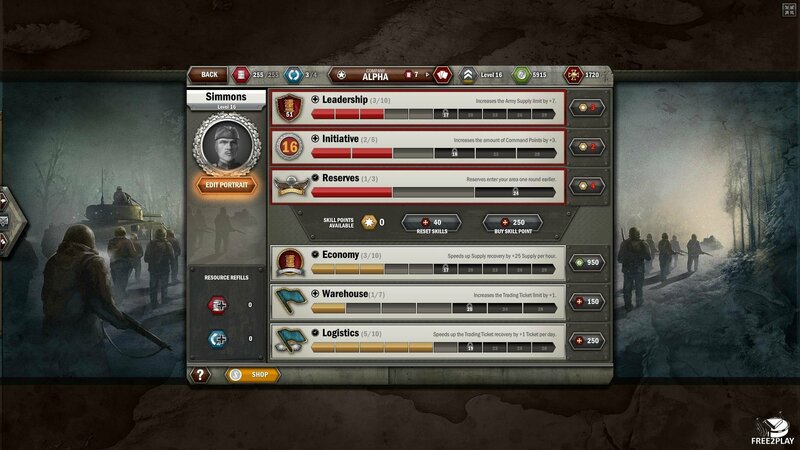 Each Lane can generate different types of terrain which offer different tactical bonuses to key units that further makes up the strategy.